Sometimes the right piece of jewelry can be incredibly elusive. If you’ve checked everywhere else and still haven’t found exactly what you’re looking for, it may be time to think about a custom design. Our jewelers will be glad to assist you with creating a custom-made ring, bracelet, necklace, or another item. Our custom designs often originate from ideas customers have created themselves, a picture from a magazine, duplication of a lost treasure or something a customer has seen but can’t locate. We will be happy to guide you through the custom design process from the idea stage, to sketches, wax models, and the completed piece. Our multi-step design process ensures that you will get exactly what you want. If you can dream it, our jewelers can make it. Bring us your ideas today! We begin the custom jewelry design process by listening to our customers’ ideas. We work together to capture the vision and then create a sketch of the desired piece. With approved sketches in hand, our master craftsmen begin the delicate process of carving a wax prototype to scale. We use the “lost wax” casting process, by which we create a wax model of the final product. This step provides our customers an extremely accurate preview of what the finished piece will look like. In this stage, we are still able to make revisions to the piece if necessary. 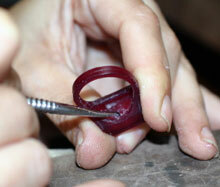 Our perfected wax models are then transformed into the actual cast we use to forge your jewelry. This is a very delicate and tedious step because creating the cast destroys the wax model. If there is any error in this process, the jeweler must start over. The cast is a rough form of the final piece. Once the cast has cooled, our craftsmen use great care and precision to file off jagged edges and prepare the piece to receive its precious stones. During this stage, each precious stone is set by hand. 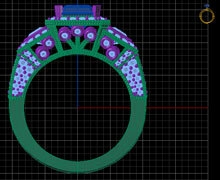 Depending on the number of stones, this may be either the shortest or longest step in the custom jewelry design process. Our craftsmen place the finishing touches on the jewelry and polish it to perfection. Each custom piece is presented sparkling and ready to wear.